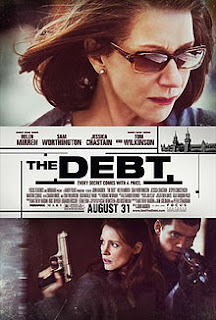 “The Debt” is an unglamorous thriller that’s not about car chases or gunfights, or unlikely leaps from one building to another. There are guns, there’s a van, and there’s an attempt to escape from East Berlin, but “The Debt” goes deeper into its characters, imprisoning the four main characters inside an East Berlin apartment and inside their own tortured lives. The prey: In the winter of 1965-66, three Mossad agents are under cover in East Berlin to extract a Nazi war criminal, the “Surgeon of Birkenau,” and return him to Israel for trial. The Nazi doctor is now “Dr. Bernhardt,” a kindly old obstetrician with a practice in East Berlin. 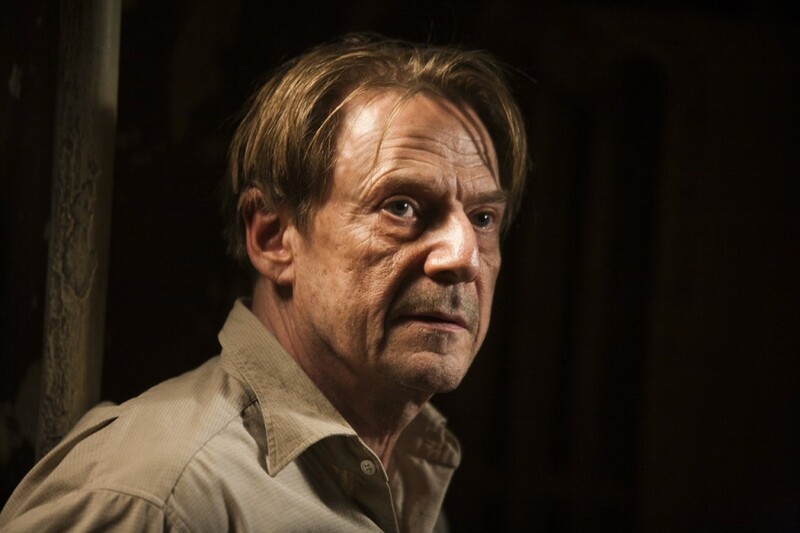 Jesper Christensen gives a chilling performance as the Nazi monster who can appear benevolent, charming, and lethal inside seconds. Stephan Gold (played by Marton Csokas in 1966, then Tom Wilkinson in 1997), to put it very simply, wants revenge and glory. He is a political animal, and an angry one. His rage is barely contained in his younger days, and well-directed by experience as he ages. Stephan’s furious piano playing in the East Berlin apartment was particularly frightening. Csokas is the only one of the primary actors with whom I’m unfamiliar, and while I cannot yet pronounce his name, I won’t forget it. David Peretz (Sam Worthington in 1966, Ciaran Hinds in 1997) wants justice, and he wants it publicly: The world must know. His sole purpose is the mission. He seems to live on despair as if he was doomed from birth just for surviving. Worthington’s face is bland, childlike, often immobile. David keeps a mask in place as long as he can. Only two things break through his discipline — the Surgeon of Birkenau and Rachel Singer. Rachel Singer (Jessica Chastain in 1966, Helen Mirren in 1997) may just want to be worthy of having survived. She had been a translator, and the East Berlin mission is her first time in the field. She is determined, but not yet as hardened as Stephan and not as fiercely stoic as David. Soon after the mission, her life revolves around keeping the truth of the mission a secret, perhaps to protect herself, Stephan, and David as much as daughter Sara. Chastain, Csokas, Worthington as Rachel, Stephan, and David in 1966. The film goes back and forth between the mission in 1965-66 and its aftermath thirty years later. The symmetries between Tom Wilkinson and Martin Csokas as Stephan as well as Helen Mirren and Jessica Chastain as Rachel are remarkable. The older Stephan is as well written and acted as the younger — an angry young man grown up, ambitious, arrogant, manipulative, not one to deny himself the objects of his lust or to restrain his fury. 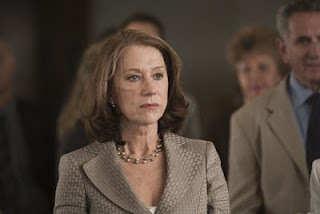 Mirren’s Rachel is Chastain grown much stronger after thirty years of building a persona for the world to see. Accustomed to being in the public eye, only David can force Rachel to reflect. Worthington’s David is less clear, and Ciaran Hinds as David thirty years later seems to be out of sync with the other actors. He has enormous sad eyes, but his character’s actions speak much louder than his words. The character David travels far in his quest for redemption, leaving Rachel to follow his path to its end. I know this, yet it seems to me David was more effective offscreen than either Worthington or Hinds were onscreen. In the 1997 story, David reappears like a revenant, unfulfilled in his mission for the world to know the truth, both about the Surgeon of Birkenau, and about 1966. Excellent lighting helps to differentiate the locations and times of the film: 1966 East Berlin was dingy, wet and cold. More rain entered the apartment than light. Once back in Israel, Tel Aviv was bright, wide open, hot with a fresh wind. 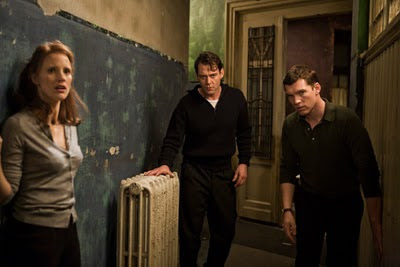 The film makes powerful use of repetition in small details of scenes; in its lighting design ranging from grays to blacks to bright whites; in sudden changes from what we’d seen before and therefore anticipated. Helen Mirren as Rachel in 1997. “The Debt” is based on an Israeli film, “Ha-Hov” written by Assaf Bernstein and Ido Rosenblum, directed by the former. 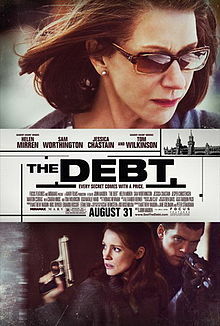 Matthew Vaughn & Jane Goldman and Peter Straughan have crafted a screenplay for “The Debt” that is taut and disturbing. Director John Madden does a fabulous job, filling the film with strained nerves, gasps, sharp turns, yet still providing food for thought. Thomas Newman’s score adds to the suspense, as does Alexander Berner’s editing and Ben Davis’ cinematography. Excellent fight choreography by Peter Pedrero presents very real people sweating, grunting, panting with the extraordinary effort to kill, capture, or just survive. “The Debt” has many white-knuckle scenes which do not dissipate like mist after the movie ends. This is an intelligent thriller, its violence intimate and terrifying, its humanity sadly fragile. ~ Molly Matera, signing off, but not shutting off the light. The world is far too scary for that. The theatre was so dark that prior to start time we could barely see to find our seats. There was nothing on the screen — no commercials, no trailers. The theatre seemed almost foggy. I took off my glasses and cleaned them. 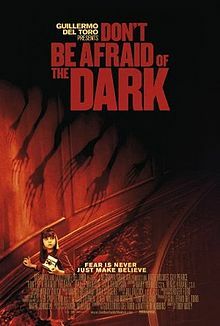 I was there to see “Don’t Be Afraid of the Dark” because I’ve enjoyed the frisson of fear Guillermo del Toro knows how to provide. He’s not the director, but he’s a producer and a screenwriter for this outing. Alas, the director Troy Nixey, and screenwriters Guillermo del Toro and Matthew Robbins thwarted my anticipation. Some opening scenes in the past (a time of buggies) tell too much. Then, a child intensely draws rings on a paper as she travels alone on an airplane. Her father picks her up at the airport, and the lack of familiarity between them is apparent. Just as clear is the child’s knowledge that her mother has sent her packing not for a vacation, but for good. You don’t pack all a child’s belongings if she’s coming back. The father is bringing an old house back to life. The wood is dark, as are the wallpaper and upholstery. The paneling is opulently sculpted, the hallways are confusing, the beds are overly ornate with carving that would scare anyone in dim light, whether the house is haunted or not. The head- and footboard designs of twisted curlicues create imaginary monsters in filtered light. The set-up is in place for a lonely child to fantasize inhabitants the adults cannot see. Unfortunately, that’s not what happens in this movie. It starts early, the too-much-showing. Guillermo del Toro is generally good at creating genuinely creepy critters, but the main problem with this film is that we see the critters. Early on. There’s no mystery or suspense, except which of these people (meaning, the actors we recognize) is going to die. In my mind, with del Toro in the mix, everyone’s fair game for death and dismemberment, including the child. - Alex, played by Guy Pearce. He’s the divorced dad, architect or some such refurbishing the neglected ruin to its former splendor and opulence. He’s put every penny he’s got into this house. Of course. Apparently he never looked at blueprints which might have shown him there’s a basement. - Kim, played by Katie Holmes, is his design partner and girlfriend, forced into the uncomfortable position of wicked stepmother without benefit of marriage. Kim, though, is not wicked; she shares artistic talent with her boyfriend’s daughter and pays more beneficent attention to her than either of her real parents. - Sally, Alex’s daughter, is played by Bailee Madison. Her mother Joanne has shipped her east from L.A., where apparently Sally is interfering in her mother’s lifestyle. Sally seems well behaved, a pretty ordinary kid considering her circumstances, and yet her mother has her on Adderall, which I looked up. There’s no evidence whatsoever that this kid has any ADHD issues. She focuses just fine when drawing, she is capable of analysis and conversation, she occupies herself, and if anything is too quiet for her age. She’s been made to grow up too fast, and the administration of Adderall makes her parents culpable for anything that ever goes wrong with this kid. - Mr. Harris, played by Jack Thompson, is the grizzled old local guy who’s the contractor working on the house and grounds. Mr. Harris’ father worked at the house before him, and told him a few things those city slickers would never believe or understand. His father was right. - Finally there’s the kindly housekeeper, Mrs.Underhill, very well played by Julia Blake. We really hope she isn’t taken. - The Critters. Do we really care who they are? The screenplay gives us information about old pre-Christian faeries, but not the pretty kind. They don’t like the light, which is supposedly why a Polaroid flash camera is used throughout. A digital camera would have served as well, since you can see the pix immediately and the cameras do flash. I have to believe this is a hangover from the 1970s teleplay on which the screenplay was based. This viewer saw way too much of the creepy critters in light and dark. Nasty-looking little beasties do nasty things, for which the child Sally is blamed. The beasties talk to her, trying to make friends. Sally is so miserable, unloved, and lonely, that she’s ready to accept the whispering things if they hadn’t been so danged destructive and mean. The standard character list in place, the locale, the monsters, everything’s ready. So, scary movie? No. While it tries for atmospheric yet realistic lighting, it succeeds at neither. It was creepier in the theatre before the film came on, what with some of the house lights not working. “Don’t Be Afraid of the Dark” is predictable, it lingers over shots of clattering little feet, on bright eyes in the corners, nooks, and crannies. For suspense to be accomplished, we ought not see these things, until very near the end, so the camera’s supposed to cut away from them. Put together all the elements and what the filmmakers wrought was an hour-and-a-half-long movie that felt like it ran over two hours. I’m proclaiming bad writing and bad directing. The actors all do their jobs reasonably well. 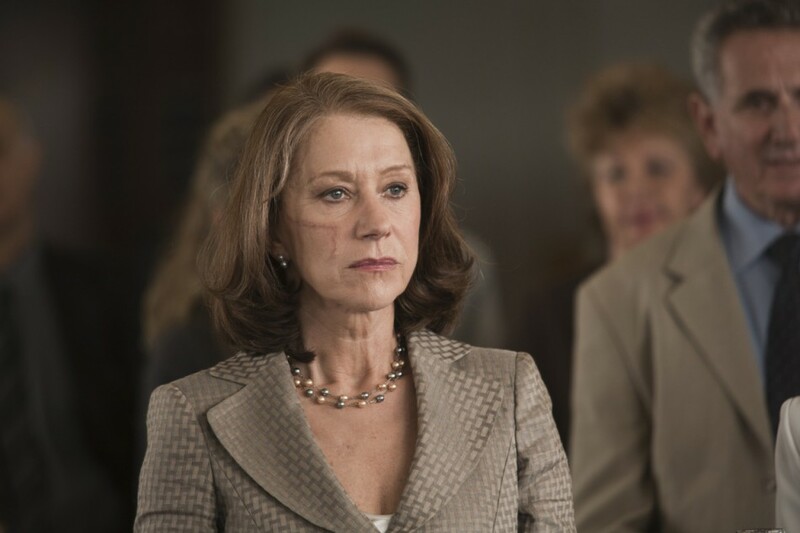 Mrs. Underhill was my favorite, but I also liked the librarian’s brief appearance (James Mackay) and the always reliable Alan Dale as the prospective purchaser of the overdone house. ~ Molly Matera, signing off with a sigh of disappointment. Thinking I’ll watch Robert Wise’s “The Haunting” from 1960 for some intelligent frights. Or maybe I'll just read.